Muyeji Freddy and his team have scoured the bush for hours, but they haven’t found what they’re looking for. Freddy would rather not return to camp so early in the day, with the sun still high, but the fruitless search leaves him no choice. “Next week, we’ll move on and camp in another place,” he tells his group of loggers, some 40 young men from nearby villages. Their home and hunting grounds are the vast highlands of the Katanga Plateau, in the deep south of the Democratic Republic of Congo in central Africa. Their prey: mukula trees, or bloodwood. For the past two years, Freddy and his fellow loggers have followed the same routine: Carrying just the bare necessities, such as tents and big cooking pots, they move through the forest to look for mukula trees, log them, and sell the wood to Chinese buyers in the provincial capital. Freddy’s motley crew stands at the start of an international business chain. The trees they carry out of the tropical forests are first transported from landlocked Congo to one of the countries on the coast of Africa — a three-month journey that usually cuts through Zambia to either Tanzania, Namibia, or South Africa — and are ultimately shipped halfway across the globe to the shores of China. In China, the red-tinted timber, also known as “rosewood”, is made into luxurious furniture to be sold all over the country. The business is profitable for those involved, but the trade is killing off trees that moderate climate change and sustain the local ecosystem. According to many environmental organizations, Congo is rife with illegal logging, and the trees are disappearing fast. They grow back extremely slowly: Trees big enough to be worth exporting take nearly a century to mature. It takes loggers like Freddy — who only have primitive axes — hours to cut down a mukula tree and strip off its hard bark to uncover the valuable wood underneath. But despite the backbreaking work involved, young men love the well-paying logging jobs. Congo is one of the poorest and least developed countries in the world. According to the World Food Programme, nearly 48 million people — more than 60 percent of the population — live on less than $1.25 a day. Little modernity has seeped through to the villages spread out over the vast savanna: People here still draw water from wells, scavenge for wood to cook with, and live in small clay huts. If it wasn’t for the mukula trees, most men would be forced to earn money by making charcoal in the bush — work that can barely feed a family. Selling one mukula log, on the other hand, earns Freddy up to $10, meaning he can afford luxuries from the outside world: a radio, fresh quilts, new clothes, and maybe some beer for the weekends. Only a fraction of what the timber is worth by the time it reaches China ends up in the hands of Freddy and his colleagues, but they are more than satisfied with their incomes. “I like to work with the Chinese,” Freddy tells Sixth Tone without hesitation. Even though the tropical forests of the Congo basin are the second-largest in the world, surpassed only by the Amazon rainforest, mukula wood is the only timber produced in the area that is traded abroad. The region is home to endangered African forest elephants, bonobos, and chimpanzees, but little is known about mukula trees. Livhuwani Nkuna, program manager at the South African National Biodiversity Institute, has studied the species and tells Sixth Tone that it offers food to many wild animals: For example, elephants eat the tree sprouts, while squirrels and baboons eat the seed pods. As the timber’s Chinese nickname, bloodwood, implies, a blood-colored oil oozes from the tree trunks when cut. It gives the timber a long-lasting protective layer with a shine and color appreciated on the Chinese market. Freddy’s career in logging began two years ago, when two Chinese men arrived in his village. Before that, he never thought mukula trees were anything special. But the visitors were very interested in the trees, and his father, the village chief, told Freddy to take them into the forest to show them the mukula. It only took a few hours for the Chinese to cut a deal with the chief, and on that day, Freddy and other young men from the village became full-time loggers — the youngest of them was only 15. In Congo, anyone can join the logging business just like that. In theory, the country’s forests are regulated by the 2002 Forest Code, which states that local governments can issue permits for “artisanal logging concessions” as long as the timber is sold on the domestic market. Foreigners are only allowed to operate logging businesses in government-approved areas. But such articles constitute nothing more than vague words in Congo’s rural areas. Most loggers Sixth Tone talked to said that the only documentation necessary for logging is a permit from the local chief. The provincial capital Lubumbashi, a few hours’ drive away from the bush, has in recent years become a hub for the bloodwood trade. On the city’s outskirts, young men gather at huge warehouses with their timber to look for Chinese buyers. Nobody cares to ask about permits, where the wood came from, or where it’s going. Lubumbashi lies near some of the world’s richest copper reserves, and the mining industry has filled the city with walled-off villas, flashy casinos, and extravagant hotels. But while copper has mostly enriched the elites, the mukula business offers a chance for local villagers to cash in on the area’s natural resources. The logging industry keeps money flowing into these remote corners of Africa largely due to demand from China, where an expanding middle class sees the faux-antique furniture made from rosewood as a symbol of status and good taste. China-based traders recall first seeing rosewood from Africa arrive in 2009. Back then, it was mostly imported from Zambia, which borders Congo to the south. But the demand for and price of rosewood skyrocketed in 2013, spurring even the most remote villages in the surrounding area to scour nearby woods for mukula trees. Nowadays, there are few places in the region left unvisited by Chinese traders. Kiombo, a hamlet of some 200 souls, is little more than a clearing in the bush of Katanga. The village’s biggest structures are three-story-high termite mounds that tower over the thatched-roof huts. Half a year ago, Chinese traders visited Kiombo and paid 76-year-old chief Sapwe Kiombo $50 to allow logging in the area. Sitting in front of his small two-room hut, Chief Kiombo tells Sixth Tone that although the business doesn’t benefit all of his villagers, he believes it’s important for the young to have jobs. “Now they can help their families,” he says. With the money that the community earns, he hopes to build a school in the village so children no longer need to walk to a school an hour away to get an education. The chief says he has no idea how many mukula trees the villagers have sold to the Chinese over the months since logging began — a common remark from locals. Freddy knows his team logged 150 trees in the past week, but he hasn’t kept track of how much bloodwood they have sold in total. “The forests are big, and there are still many out there,” he says. By and large, reliable data on the logging and export of mukula trees does not exist. The Natural Resources Network, a group of nongovernmental organizations in Congo, has tried to fill in the gaps by keeping an eye on an official checkpoint that trucks pass through on their way from logging sites to Lubumbashi. The data that the network has collected show that the volume of trees cut down between January and May 2016 totals nearly 3,300 cubic meters — about five times the number provided by the nation’s Ministry of Environment. The discrepancy is a strong indication that much of the timber is logged and exported without central government oversight or is smuggled through a corrupt system. Jacques Kalume, head of the Ministry of Environment’s Nature Conservation and Sustainable Development division, took office six months ago. He’s not based in the capital, Kinshasa; rather, the ministry sent him to Lubumbashi after it noticed a surge in bloodwood smuggling. In September 2016, a few months after Kalume moved south, he filed a report with the provincial government. “I warned them it’d be dangerous if commercial logging continued like this,” he tells Sixth Tone. Activities in the area far exceed the limits allowed by the eight government-issued permits for artisanal logging, he says. Multiple government officials have expressed their concerns over the chaos in the country’s forests. Jeanine Bikela, head of the Forest Management Department at the Ministry of Environment in Kinshasa, tells Sixth Tone that the government lacks the staff, funding, and equipment to properly monitor logging activities. But above all, corruption and mismanagement are to blame. “Money can do everything. It’s Congo,” says Gao, a middle-aged man from northern China who operates a bloodwood warehouse in Lubumbashi along with a Chinese business partner. “When officials knock on your door for inspection, what they want is money,” he laughs. The cost for bribing an official is usually only about $100, depending on the official’s rank. From the outside, Gao’s warehouse is nondescript, lacking any signage and hidden behind a rusty iron gate on a backstreet. Inside, a crowd of two dozen Congolese men sing as they load bloodwood into a container by hand. During a break from the heavy work, they gather around Gao’s table in the corner, asking for cigarettes. Gao tells Sixth Tone that he started working at a timber mill in Congo a few years ago. It was his first time working abroad. In the years since, he has learned the ins and outs of Lubumbashi’s timber industry. Gao knows how the Congolese like to do business: with cash, verbal agreements, and bribery. Less than a year ago, he moved to Lubumbashi. Once a week, Gao drives out to the villages in his SUV to collect wood, though some loggers bring their wares to him instead. There are about 10 Chinese-owned bloodwood trading companies in Lubumbashi. Few have proper company registrations, making them hard for both the government and environmental NGOs to keep track of. Right behind Gao’s warehouse, a family from southern China runs a timber mill. A young man who only gave his nickname, Ah Quan, tells Sixth Tone that his family runs two logging concessions near Lubumbashi, which is illegal for foreigners. “We let the locals cut the trees, and we buy them,” he says. Ah Quan moved to the city two years ago to help with the family business. The family’s house in Lubumbashi is guarded by several armed police officers — a legal and common arrangement in Congo. NGOs criticize Chinese traders for stimulating corruption in Congo. But Ah Quan shrugs off such claims. As he sees it, he has to follow the unwritten rules of the game to get ahead in a country rife with corruption. Ah Quan says only high returns are worth the dangers that come with working in the country, adding that his relatives have even been robbed at gunpoint. Exporting timber without the proper documents is illegal, but a few companies offer trading services that help grease official wheels. When Sixth Tone posed as a potential client to one such company — Chinese-owned Macaron Africa — in Lubumbashi, the company sent a contract with a previous client to export 25 tons of mukula timber. It included a $5,500 fee for bribing customs officers. Despite laws that ban foreigners from operating logging concessions, authorities are aware that foreign merchants ultimately control the trade. Yet few steps have been taken to crack down on the bloodwood industry. The story is much the same in other African countries. Weak laws and inadequate oversight are no match for the ferocious demand for mukula wood. 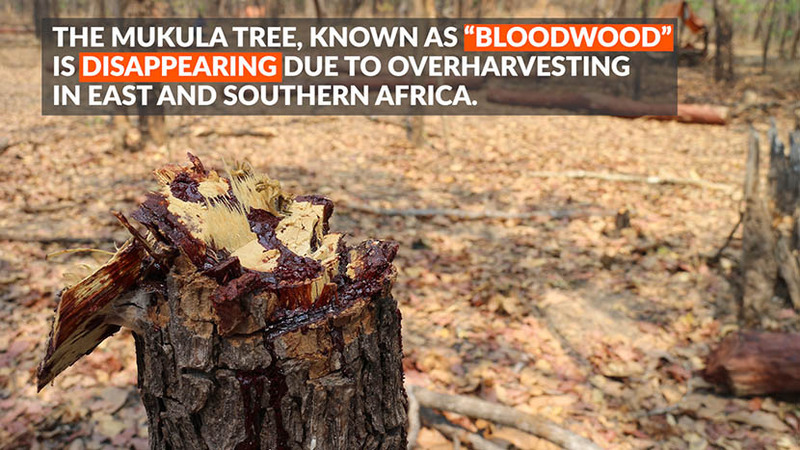 Zambia, Tanzania, Malawi, and other countries have seized illegal shipments of bloodwood over the past few years. Zambia’s President Edgar Lungu has said on multiple occasions that illegal mukula logging is a threat to the species that must be stopped immediately. But the business continues there, and elsewhere, apparently without much hindrance. Environmental groups have called on the Chinese government to ban the import of illegally sourced timber and its products, and to more closely track the sources of wood coming into the country. Currently, the responsibility to report the source of timber is only included in voluntary guidelines for Chinese timber companies. Stricter measures only apply for a limited number of tree species — not including mukula — listed in the appendix of the multilateral Convention on International Trade in Endangered Species of Wild Fauna and Flora. Sun Xiufang, program analyst at international environmental organization Forest Trends, tells Sixth Tone that China sees the current policies governing the timber trade as being in line with its policy of noninterference in other countries’ internal affairs. To import timber from Congo into China, all that merchants need is documentation to show it was exported legally — documents that can easily be obtained in underhanded ways — more specific information about its sourcing is not required. Chatham House, a U.K.-based think tank, estimates that over 15 percent of China’s imported wood products are brought into the country illegally. That number is down from about a quarter in 2000 — but since total imports have increased, the absolute volume of illegally imported wood has grown nonetheless. The weakness of China’s current regulations is reflected in the matter-of-fact way rosewood traders at the wood market in the Chinese coastal city Zhangjiagang, not far from Shanghai, talk about their products. Mukula logs arrive from Congo and other African countries on a daily basis, and traders openly admit that their timber comes from questionable sources. For hundreds of years, Chinese carpenters have turned rosewood into furniture. The industry long ago pushed domestic species to the brink of extinction, forcing traders to look for the trees elsewhere in Asia. After these countries cracked down on illegal exports one after another, companies shifted their focus even farther afield. In July 2014, China’s rosewood imports from Africa surpassed those from Asia for the first time. Several timber traders tell Sixth Tone that they seek out countries with few or weak regulations. One Zhangjiagang businessman surnamed Li says that with the industry reliant on so many endangered tree species, the only way forward is to keep looking for new varieties to use. A Chinese trader surnamed Liu operates a bloodwood warehouse in Lubumbashi. She tells Sixth Tone that her family runs businesses in several African nations. They used to export most of their bloodwood from Zambia, but after that country introduced stricter laws, Liu and her husband moved to Congo. “We go wherever we can find resources,” she says.